We’ve covered some oddball engagement trends over the years (remember when guys were shoving rings into avocados?). But it’s a rare day when engagement-party catering spills onto the jewelry beat. But here we are at that zany dovetailing. Instagram, by way of Food & Wine, has exalted a new dessert designed for engagement celebrations—cookies in the shape of women’s hands wearing engagement rings. 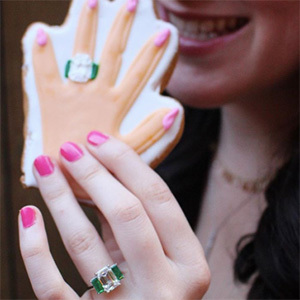 Cookies in the shape of engagement rings at engagement parties are have become common—but the hands-for-eating trend is new. And controversial, even among the people making them. “Can’t decide if these are really cute or really creepy,” writes baker Keren Greenberg, under a recent Instagram post showing cookies done up as red-tipped manicured hands with pearl bracelets and pearl engagement rings. Personally, I think the hands that look like actual hands are a little creepy. But I love the iterations that are more cartoonish, such as the ones above that are stamped with a couple’s wedding date and include manly hands clad in wedding bands (above, posted by @kurabiyeji). But I like the campiness of the concept and the creativity being shown by pastry chefs—especially when it comes to rendering the jewels!